The other evening suppertime approached and the only ideas I had involved ingredients in my refrigerator. 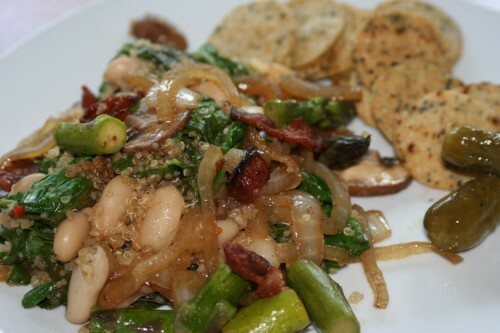 I took those ingredients--bacon, spinach, quinoa, cannelini beans--and went to find a recipe. The result was this delicious hot salad! I used leftover cooked quinoa (cajun spiced!) and the meal came together in a snap. The red wine vinegar added a tasty, unexpected zing. And come on, anything with bacon and asparagus is pretty darn tasty. Meanwhile, cook the bacon in a pan, about 4-6 minutes, and set aside, reserving 1-2 Tablespoons of bacon grease. Caramelize the onions, mushrooms, and asparagus in the remaining bacon grease, about 20 minutes. Set aside. Add the vinegar to the pan and deglaze it. Mix in the reserved bacon grease, sugar, mustard, garlic, and season with salt and pepper. Add the spinach and the beans and cook until the spinach wilts, about 3 minutes. Remove from heat. Mix in the bacon and veggies. Spoon over the quinoa, or mix it all together in the pan before serving. Oh this looks so good! And that is so true about bacon! Oh we love quinoa in our house, infact it was one of the dishes I made for my daughter's first birthday (she is almost 4 now) and she gobbled it up! Your post made my weekly "Five to Try" post ... keep up the good work!